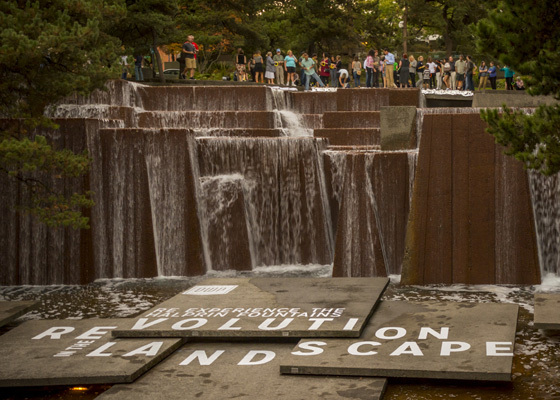 Revolution in the Landscape: Re-experience the Halprin Fountains was a Design Week Portland 2014 event produced by the Society for Experiential Graphic Design (SEGD) Portland, to explore and promote inter-disciplinary design thinking and collaboration about communications in the built environment. 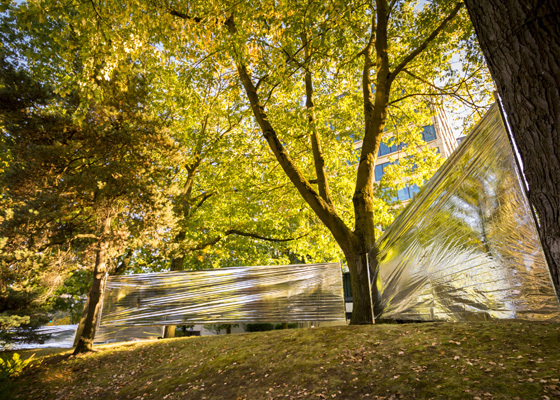 Mayer/Reed was one of seven design teams invited to create a temporary installation along the Portland Open Space Sequence, designed by Lawrence Halprin and constructed between 1966 and 1970. 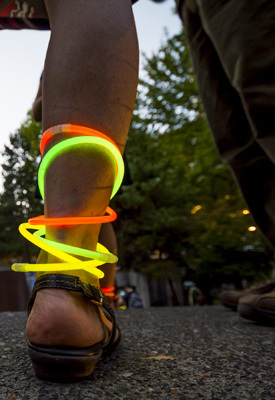 Typography, color, image, form, light and sound converged for one magical, two hour long, moon lit evening to raise public awareness about this historic cultural resource comprised of four interconnected parks, fountains and civic spaces. Mayer/Reed’s installation “We Are All in This Together” at the Ira Keller Fountain was the starting point for the event. 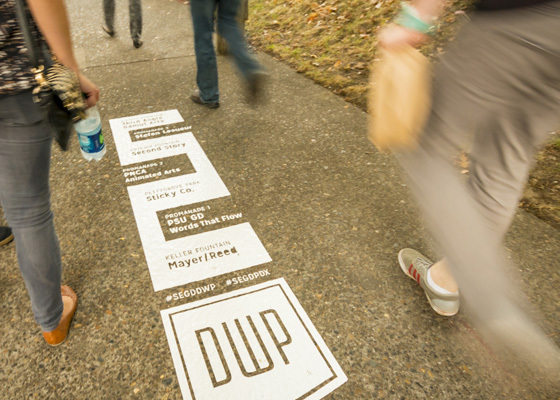 Using the plaza at the base of the fountain as a canvas, super-scaled typography introduced the event. 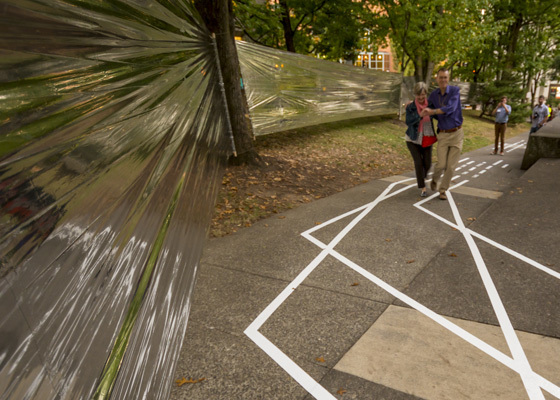 Lines and words, installed as pavement vinyl, formed a path leading through the site as an artistic pattern interpreting the energy and choreography of Halprin’s design. The pattern was simple in quiet locations and most intense near the top of the cascading fountain. 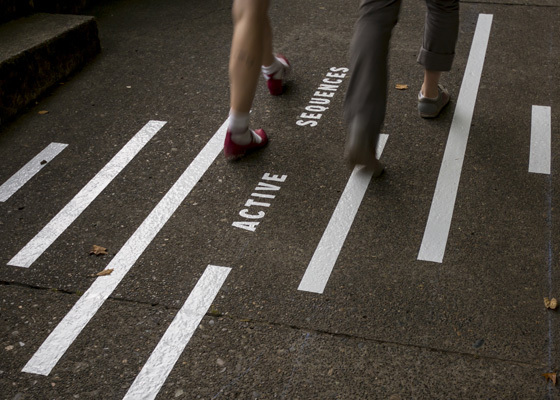 Words such as “activate, join, dance” hint at the concepts prevalent in all the spaces. Here, participants reached into the fountain to take a glowing necklace as a symbolic joining of the event and gesture of “togetherness” — creating a flow of glowing humanity through the sequence. 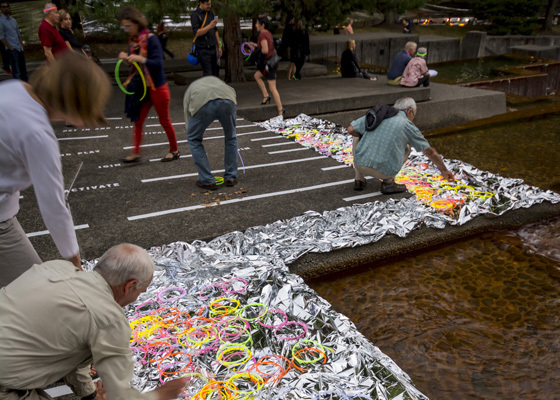 A river sculpture constructed from reflective mylar space blankets suspended between the trees flowed through the space, reflecting the activity and varying ambient light, as participants explored the site and then moved upstream toward the next installation.